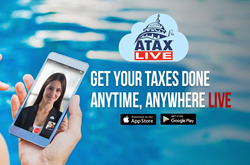 As a new alternative to getting your taxes done by visiting a tax preparation office, ATAX President, Founder & CEO, Mr. Rafael Alvarez, announced a new breakthrough technology called ATAX Live – a mobile app that allows taxpayers in the United States to file their taxes from anywhere, at any time. With this new app, ATAX expands its growth and makes this service available to all new and existing clients. ATAX Live is a free mobile app for iPhone and Android devices. It is available in both app store marketplaces – Apple App Store and Google Play. In just a few simple steps, you can create your free account, upload your documents from your mobile device, and be on your way to receiving your tax refund. According to Mr. Rafael Alvarez, ATAX Live is one of the greatest achievements for the company, as ATAX continues to innovate and stay on top of the latest technology trends. ATAX Live is an easy, safe, and secure way to get your taxes done. It’s free and easily accessible by using the website: http://www.ataxlive.com. ATAX is a leading provider of tax preparation, bookkeeping, payroll & incorporation services for over 30 years --- with over 40 locations nationwide and growing! At ATAX, we’re about more than just numbers! ATAX is the first Latino-owned tax preparation franchise in the United States.